"Arrow of Light" redirects here. For the Arrows of Light used in Pit's SSB4 Final Smash, see Three Sacred Treasures. Zelda and Sheik using the Light Arrow in Super Smash Bros. for Wii U. 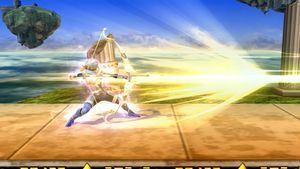 Light Arrow (光の弓矢, Bow and Arrow of Light) is the Final Smash of both Zelda and Sheik in Super Smash Bros. Brawl and Super Smash Bros. 4. When used, Zelda/Sheik draws a large bow and sets an arrow. During this time, any characters in her line of sight will flinch. 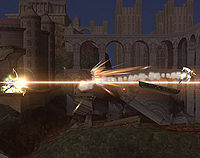 A second later, the Light Arrow is released, dealing significant damage and likely KO'ing the struck characters, although its power decreases drastically for every target caught in the blow. Zelda receiving the Light Arrows in Twilight Princess. In conjunction with the Master Sword, Light Arrows have been used in The Legend of Zelda series as a weapon used to stun Ganon/Ganondorf, leaving him vulnerable to the Master Sword. The concept for them probably comes from the original NES The Legend of Zelda, in which Link used a similar weapon called the Silver Arrow to defeat Ganon. Link was first able to wield the Light Arrows in The Legend of Zelda: Ocarina of Time, where he utilized them in the penultimate showdown with Ganondorf. The first incarnation of Zelda to use Light Arrows was the Zelda in The Legend of Zelda: The Wind Waker (also known as Tetra), wielding Link's Hero's Bow and Light Arrows in the final battle against Ganondorf. 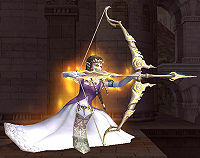 The bow and Light Arrows used in Smash Bros. are based on the The Legend of Zelda: Twilight Princess design, in which Zelda is granted the Light Arrows by the Spirits of Light and once again uses them in the final battle against Ganondorf. This move covers a large distance from the user's line-of-sight, ignoring any terrain in the way. In Brawl, it seems to cover infinite distance, but in SSB4, it has a maximum range. There are two hits involved in the move: a weak, stun hit, and the main hit which follows it. The stun hit occurs just before the main hit of the move and is designed to keep opponents in place for the main hit. It has limited range, covering the distance of approximately 1.7 times the length of Final Destination. It is possible through timing or placement for a target to be hit by only this hit and not the main hit, or vice-versa. In Brawl, the stun hit has limited range while the main hit does not, meaning a target can be too far for the stun hit but not for the main hit. In SSB4, the main hit's range is now limited, covering the same distance as the stun hit. The main hit of the move deals a large amount of damage and knockback, both of which vary between Zelda and Sheik's versions. It deals reduced damage to successive targets; anything that can be hit, including players, bosses, items (such as crates and Assist Trophy summons), and attackable stage elements, can all be hit by the attack and reduce the damage of the main hit to subsequent targets. This move penetrates opponents' shields. Unusually for Brawl, this Final Smash also ignores super armor, and can therefore successfully hit opponents that are in super armor frames. This is likely due to the paralyzing effect of the first hit, which overrides the super armor and allows the main hit to connect with full power. While the basic move is the same whether Zelda or Sheik uses it, the properties of the arrow are slightly different for each of them. The primary difference is that Zelda's launches at the Sakurai angle (and thus usually about 45 degrees), while Sheik's launches at a semi-spike angle (10 degrees in Brawl and 20 degrees in SSB4). Zelda's Light Arrow also does less damage but more knockback than Sheik's Light Arrow; in Brawl, Zelda's has enough knockback to one-hit KO the first target at 0% damage, though it is barely in the OHKO threshold and can be DI'ed. In SSB4, Zelda's Light Arrow, while still powerful, can no longer OHKO. In both games, Sheik's Light Arrow can be very powerful against fighters with poor recoveries due to its semi-spike angle, especially if used on recovering opponents. The move can hit a maximum of 8 targets in Brawl and 7 targets in SSB4, with reduced damage (and thus knockback) for each target hit. Thus, if used on many targets, the further ones will take much less damage, and further opponents may not be KO'd even at high percentages. For each fighter the arrow connects with, the match will pause as the camera does a slow-motion close-up of each hit one in order (similar to the Dragoon). This zoom effect is faster in SSB4 than in Brawl. In Brawl, opponents that are close together when hit by this move may collide with each other, potentially preventing them from being KO'd. Thus, spacing of opponents is very important when using the Light Arrow. This is even more important in Sheik's version, where opponents are launched at a very low angle. For both Zelda and Sheik's Light Arrows, the stun hit that occurs first deals 3% (3.15% fresh) damage in Brawl and 1% (1.05% fresh) damage in SSB4. Successive targets hit by the main hit of the move multiply its damage by 0.75 for subsequent targets. The stun hit's damage is not affected by the number of targets. The below tables detail only the main hit's damage. Princess Zelda's Final Smash. She wields a mighty bow of light with which she can attack from afar. Her arrow travels in a straight line and flies through all characters unlucky enough to be in the way. This attack cannot be blocked. The more enemies there are, the higher the chances to get them all with one shot. More is always better! Sheik's Final Smash. After grabbing a Smash Ball, Sheik will be able to wield a bow of light. The arrow fired from this bow has the power to pass through multiple targets, so it will damage all enemies in the direction it flies. This, coupled with its shield-breaking power, makes it even more terrible. Even in Sheik form, Zelda's ability as an archer is undiminished. In many of the Legend of Zelda games, the sacred Light Arrows are required to defeat the final boss. 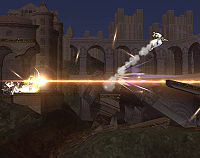 In this game, Zelda fires one straight across the screen for her Final Smash. If it passes through multiple foes, the ones hit first will take the most damage. The Light Arrow has a lot of launching power, making it great for getting KOs! Sheik's Final Smash uses a gigantic bow to fire a Light Arrow across the screen. If multiple foes are in its path, it will strike them all, ignoring shields like they're not even there. Sheik's Light Arrow is more damaging than Zelda's and it launches its victims at a lower angle. Sheik's Final Smash uses a gigantic bow to fire a Light Arrow across the screen. If multiple foes are in its path, it will strike them all, even penetrating straight through their shields. Sheik's Light Arrow is more powerful than Zelda's and it launches its targets at a more shallow angle. 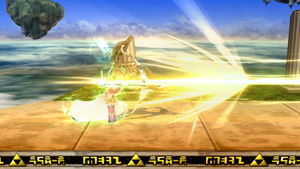 Light Arrow is one of the only Final Smashes shared by multiple characters, along with Landmaster, Triforce Slash, Critical Hit, and PK Starstorm. It is one of two Final Smashes shared by multiple characters to be completely removed between games, alongside Landmaster. Dark Pit Staff is very similar to this move, and is often considered a clone of Light Arrow due to its similar properties (down to the zooming in on hit). The same can be said about Ancient Bow and Arrow; however, as Light Arrow has been replaced in Super Smash Bros. Ultimate, Ancient Bow and Arrow could also be considered its successor (though it is used by Link rather than Zelda or Sheik). Zelda striking Sheik with her Light Arrow in Super Smash Bros. for Wii U.
Sheik striking Zelda with her Light Arrow in for Wii U. This page was last edited on April 17, 2019, at 19:09.